For many months I've been meaning to create the code for a split-plot design. The basic split-plot design has each subject participate in every level of factor B, but only one level of factor A. In this blog post, I report an example of a hierarchical Bayesian approach to a split-plot design, coded in JAGS (not BUGS). As this is my first go at this sort of design, please consider this a preliminary version of the analysis, and please provide feedback regarding any errors or infelicities. I'm also looking for people to do analogous NHST analyses for comparison, and I'm looking for other data sets for additional examples. To make things concrete, consider an example provided by Maxwell & Delaney (2004, Designing Experiments and Analyzing Data: A Model Comparison Perspective, 2nd Edition, Erlbaum; Ch. 12). (As I've mentioned elsewhere, if you must learn NHST, their book is a great resource.) A perceptual psychologist is studying response times for identifying letters flashed on a screen. The letters can be rotated off of vertical by zero degrees, four degrees, or eight degrees. Every subject responds many times to letters at each of the three angles. The experimenter (for unknown reasons) analyzes only the median response time of each subject at each angle. Thus, each subject contributes only one datum at each level of angle (factor B). There are two types of subjects: "young" and "old." Age of subject is factor A. The structure of the data is shown below. Y is the median response time, in milliseconds. There are 10 subjects per Age group. 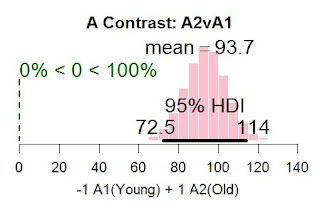 Split-plot designs are difficult to analyze in NHST because it is challenging to select an appropriate "error term" for constructing F ratios of different effects. Ch. 12 of Maxwell & Delaney is devoted largely to explaining the various options for error terms and the different F ratios (and different p values) that result. Split-plot designs get even more difficult when they are unbalanced, that is, when there are different numbers of subjects in the different levels of factor A. And, of course, when we do multiple comparisons we have to worry over which corrections to use. In a Bayesian approach, on the other hand, there is no need to worry over the selection of error terms because we never construct F ratios. And there is no difficulty with unbalanced designs because the parameters are estimated based on whatever data are provided. The only challenge, in the hierarchical Bayesian approach that I prefer, is the construction of sum-to-zero parameterized effects. In all the ANOVA designs described in the book, the parameter values are converted so the effects, as deflections from baseline, sum to zero. (In case you haven't seen it yet, there is an important update regarding the sum-to-zero computations in the book's ANOVA programs, linked here.) With some effort, I figured out a way to convert the parameter estimates to sum-to-zero versions. It is done in R, outside of JAGS. The index i goes over rows of the data table, and Ntotal is the total number of data points. The data values, y[i], are assumed to be normally distributed around the predicted mean mu[i]. The predicted mean is the overall baseline, base, plus a deflection a[aLvl[i]] due to being in level aLvl of factor A, plus a deflection for each subject, plus a deflection for factor B, plus a deflection due to interaction of factors A and B. There is a hierarchical prior on each type of deflection, so that the variance of the deflections is estimated. January 8, 2012: It was pointed out to me that the SD estimates for aSD (age), bSD (Angle), and axbSD are not very stable, even for chains of length 100,000. The reason is that only a few values inform the estimates. Specifically, for aSD, only two values inform it, namely a and a, so it is very uncertain. And for bSD, only three values inform it, namely b, b, and b, so it too is very uncertain. I therefore included a warning message in the display. . Estimates of the effects (graphs below) are stable. This agrees with the conclusion from NHST analysis from Maxwell and Delaney, who reported F(1,18)=7.28, p=.0147. 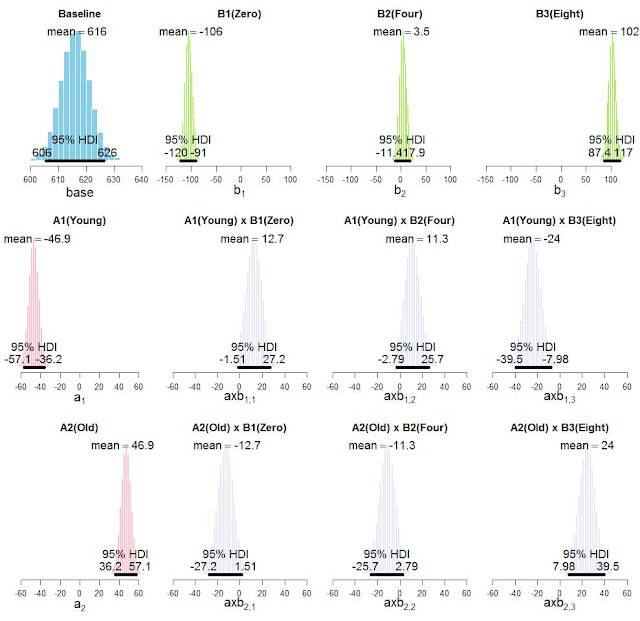 But the Bayesian posterior seems much more powerful than the NHST p value. 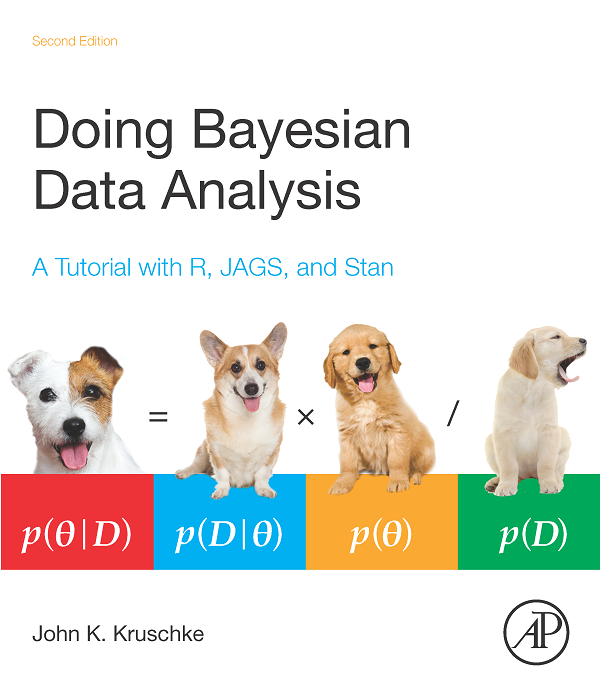 Did I do something wrong, or is the Bayesian analysis simply much more powerful in this design? This result agrees with the conclusion from NHST reported by Maxwell & Delaney (pp. 602-605), with F=3.16 and p=.092, or F=3.08 and p still >.05, depending on the choice of error term. 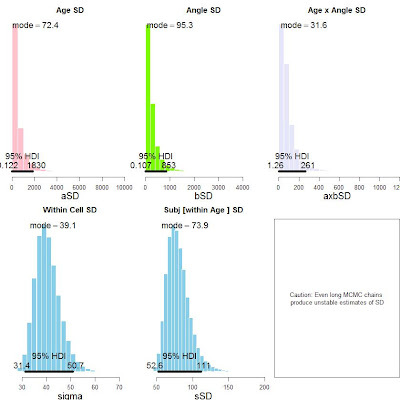 The right panel above shows a contrast that investigates the difference of quadratic trends across the age groups. A quadratic trend for the three levels of angle has contrast coefficients of 1,-2,1. 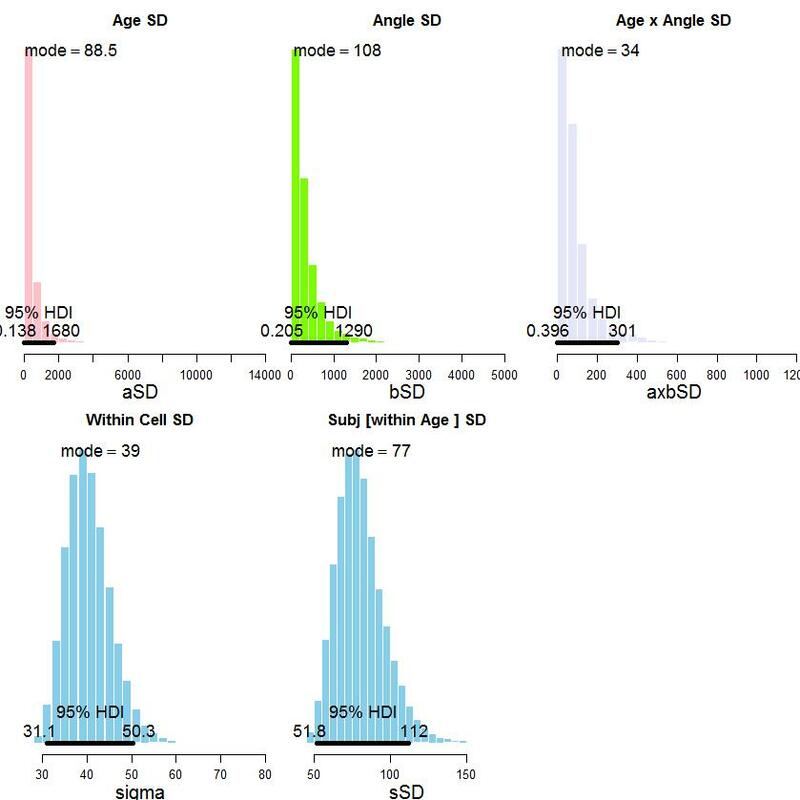 The question is whether the contrast is different across the two levels of age. 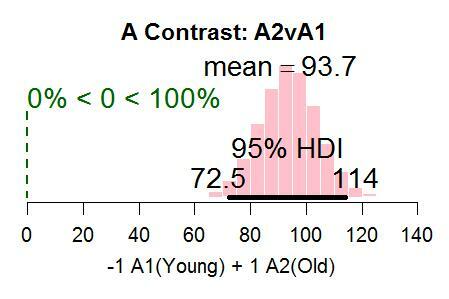 The Bayesian analysis shows that a difference of zero is within the 95% HDI. This result agrees with conclusion from NHST reported by Maxwell & Delaney (pp. 605-607), with F(1,54)=3.101 and p>.05, or F(1,18)=4.038 with p>.05, depending again on the choice of error term. As usual, the above contrasts would have to be corrected for multiple comparisons in an NHST approach. 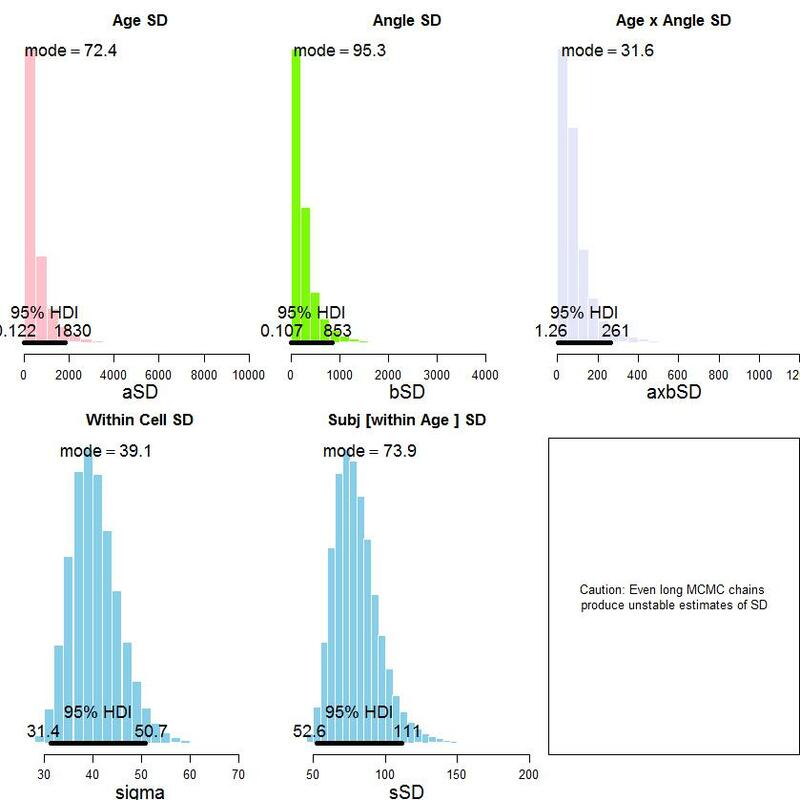 It is seamless to analyze an unbalanced design in the Bayesian approach. For example, the analysis runs completely unchanged (with different results) if we simply delete the last subject from the data table, so that there are 10 subjects in level A1 but only 9 subjects in level A2. The data file is linked here, and the program is linked here. To run the program, just put it in the same folder as the data file and make sure that R has that folder as its working directory. The program uses JAGS and rjags, not OpenBUGS and BRugs. You must first install JAGS. JAGS runs on all platforms, including Mac and Linux! And then in R you must install rjags; just type install.packages("rjags"). Click here for the full text of all the reviews on Amazon. Thanks again, reviewers, for the nice comments and for helping prospective readers.